Select A Display Screen For Your Car PC. In many ways the display screen is the most important part of any carputer installation, since this is the way you interact with the computer whilst driving. For ease of use, you really need to use a touch sensitive screen. A conventional keyboard and mouse are not an option whilst moving. Some computer monitors are supplied with remote controls but again these are not the answer when driving and they are not exactly intuitive. There are many types of computer display to choose from and where you want to position it will play a part in your choice. Sun visor and roof mounted models are available, but these are more suitable to passenger viewing, or as a dedicated visual display unit for a reversing camera. 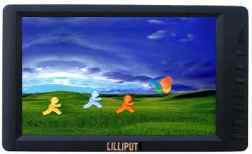 A "Liliput" touch screen monitor. The way of fitting a display in your car which potentially involves the least installation effort, is to leave your car stereo in place and take advantage of the existing amplifier, FM tuner and control knobs. Fitting it in the fascia gives the best appearance. However, this may call for fabrication skills to achieve the factory fitted look. Once you have decided on the position, you will know the display size you can fit. A 7" monitor gives a very acceptable image, but as with so many things in life, bigger is better. If you have room for an 8" monitor, the image is easier to view. If you intend to build the display into your console, do have a very clear idea of how you intend to do it before deciding on a particular model. Choose a model which has more than one video input if you wish to also fit a rear-view camera. If your dashboard layout has no room to fit a display without removing your existing car stereo, you have 4 options. You can fit an extension lead between the wiring harness and your car stereo, and try to find a suitable place (e.g. the glove box) in which to re-locate it. Fit a separate amplifier. This is complete project in its own right but if you are looking for a quality of sound which your factory fitted stereo cannot deliver, this could be the option for you. You can fit a motorised monitor as discussed below. These are available to fit single and double DIN slots, and are also available with and without tuner/amplifiers built into the unit. Completely redesign the fascia and build a new one from scratch. This is definitely not recommended unless you are a DIY wizard and have plenty of time on your hands OR you are willing to pay the expense of having it customised professionally. 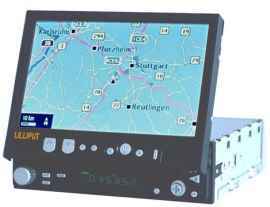 One alternative is a motorised screen which fits into a standard single DIN or double DIN slot. The top photograph shows this type of unit with the display fully extended. The bottom photograph shows a similar unit with the display fully retracted. It needs less customisation effort to fit. It looks very unobtrusive with the display fully retracted. It may obstruct instrument displays or controls when fully extended. When fully extended, it looks "stuck-on" as an afterthought and could never be taken for a factory fitted accessory. It adds another moving part which could go wrong.